I did not wear green on St. Patrick’s Day. Nor did I attend any St. Patrick’s Day event. I ate no corned beef and cabbage, and I raised no pint of Guiness. 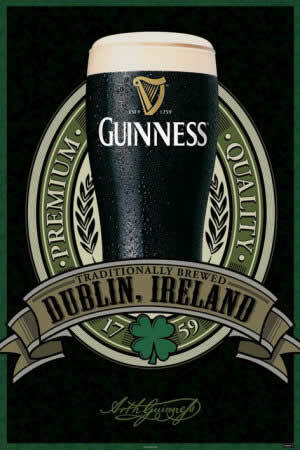 But, I did read, much to my environmentalist delight, that Guiness, the legendary Irish brewing company, has made significant commitments to sustainable practices, earning them an installment in my Celebrating Eco-Progress series. That parenthetical note, that the actual brewing is done at a different facility, does seem a bit of a letdown, and of course the Guiness we drink here in the States necessarily has a regrettably large carbon footprint just for being shipped here. And yet, as I’ve always said about the companies I feature in Celebrating Eco-Progress, in recognition that every little bit of effort does indeed help, I applaud the measures that have been taken, and I encourage us all to applaud them as well, indicating loud and clear that this is, indeed, a direction their customers would like to see them continue going in. I’ve written before of my fondness for being down at the pub, having a pint with the lads, so I’m looking forward to, first chance I get, lifting a glass of Guiness stout and drinking it with hope for a sustainable future. Next ›Crocus: Spring Has Sprung! Nothing like mixing pleasure with worthwhile causes. Thanks for bringing this to my attention! Nothing like mixing pleasure with worthwhile causes. So true! There’s a group called Green Drinks that is built on this idea.